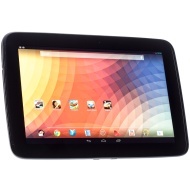 alaTest has collected and analyzed 2456 reviews of Samsung Google Nexus 10 (P8110). The average rating for this product is 4.2/5, compared to an average rating of 4.5/5 for other products in the same category for all reviews. Views about the design and price are on the whole positive. The usability and screen are also mentioned favorably. The storage and battery get negative views. Views are divided on the camera. The Nexus 10's superior design and swift performance make it one of the best Android tablets to date. Worthy challenger to the iPad. Very close to the best tablet on the market. Beautiful screen, fast and easy to use, reliable, excellent value for money.